Q1. Which of the following is the dimension of new 500 rupee note? Sol. The dimension of new Indian 500-rupee banknote is 66×150 mm, Width–150mm & Height–66mm. Q2. Which of the following is the base color of 2000 rupee note? Sol. The base color of 2000 rupee note is Magenta. Q3. Which of the following is the dimension of 2000 rupee note? Sol. The dimension of Indian 2000-rupee banknote is 66 × 166 mm, Width – 166mm & Height – 66mm. Q4. Which of the following is the color of new 500 rupee note? Sol. The color of 500 rupee note is Stone Grey. Q5. Which of the following features on the reverse of 2000 rupee note? Sol. The reverse side of 2000 rupee note features Mangalyaan, India’s first interplanetary space mission. Q6. Which among the following sectors contributes most to the saving in India? Q9. Which of the following schemes has been launched for providing health services in rural areas? Q10. 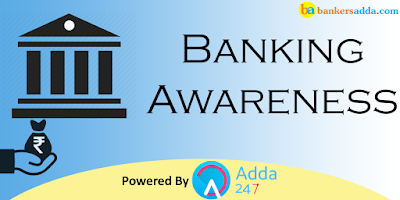 Which of the following is NOT a banking related term? Q12. What is the initial capital amount to start Small Finance Banks? Sol. The firms must have a capital of 100 crore to set up small finance banks. Q13. The promoters of Small Finance Banks should have _______ experience in banking and finance? Q14. Which of the following is the first Regional Rural Bank of India? Sol. Prathama Bank is the first Regional Rural Bank of India. Q15. India Post Payments Bank (IPPB) has been recently incorporated as a Public Limited Company under the Department of Posts with _______ equity.